We are Roanoke’s most gentle and complete wildlife service! A All Animal Control is your local wildlife experts and are commonly called upon to control Bats, Birds, Beaver, Cats, Coyotes, Chimney Swifts, Chipmunks, Deer, Flying Squirrels, Fox, Geese, Groundhogs, Mice, Moles, Muskrat, Opossum, Pigeons, Raccoons, Rats, Skunks, Snakes, Squirrels, Sparrows, Starlings, Turtles and Woodpeckers. We specialize in the removal of deer, bats, squirrels, skunks, snakes and groundhogs. Proudly serving the greater metropolitan area of Roanoke, Salem, Blacksburg, Christiansburg, Smith Mountain Lake VA and surrounding communities. We also service the city, cities and towns of Amsterdam, Austinville, Bedford, Big Island, Blacksburg, Buchanan, Blue Ridge, Boones Mill, Catawba, Cave Springs, Christiansburg, Cloverdale, Crockett, Daleville, Draper, Dublin, Elliston, Fairlawn, Ferrum, Fincastle, Floyd, Forest, Fort Chiswell, Goode, Hollins, Indian Valley, Ivanhoe, Max Meadows, Moneta, Mount Tabor, Narrows, New Castle, New River Valley, Pearisburg, Pembroke, Peaksville, Penhook, Pulaski, Radford, Rich Creek, Riner, Roanoke Valley, Rocky Mount, Rural Retreat, Salem, Shawsville, Simmonsville, Smith Mountain Lake, Speedwell, Vinton and Wytheville. The county or counties that A All Animal Control services are Bedford, Botetourt, Craig, Floyd, Franklin, Giles, Montgomery, Pulaski, Roanoke and Wythe. 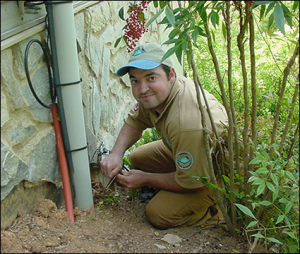 A All Animal Control, a Nuisance Wildlife Management company is a leader in providing wildlife, animal and pest control services for residential, industrial and commercial clients in Roanoke and Salem, Virginia and surrounding communities. We can handle any wildlife control problem from mice to deer and provide incredible service while using the latest technology and equipment. To control wildlife requires a qualified and experienced expert to assure you of expert care of your wildlife problem. Your wildlife expert has been specially trained in the control of wildlife specific to Roanoke and Salem, Virginia and will take care of the problem in the most gentle and humane way possible. All wildlife experts of A All Animal Control undergo a rigorous training program for wildlife control in order to give you the most efficient and cost effective solution to your problem. Their wildlife professionals are licensed and insured for your protection and comply with all laws regarding wildlife control. A wildlife expert is just a phone call away and can often assist with your Roanoke and Salem, Virginia wildlife control needs the very same day. Call us at 540-701-6757 to put an end to that annoying wildlife problem and control damage wildlife causes.